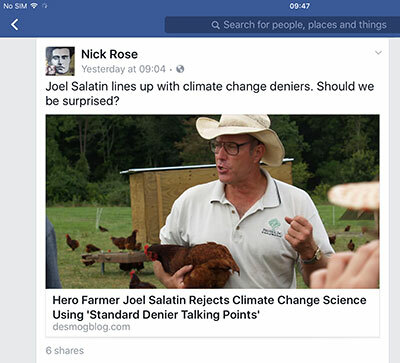 RESPONSES TO Nick Rose’s Facebook link to an article revealing regenerative agriculture hero — Joel Salatin of Polyfaces farm in the US — to be a climate change denier has elicited responses citing concerns over his social, political and religious attitudes. Nick set up the Australian food advocacy organisation, Sustain: The Australian Food Network, and previously worked with the Australian Food Sovereignty Alliance (clarification: so did the author). He is now a lecturer in food systems at a Melbourne tertiary institution. As a self-proclaimed Christian, evangelical, libertarian and environmental “lunatic” — a claim he made at his Sydney appearance at the Teachers’ Federation auditorium some years ago — the possibility of his ideological links with America’s politically powerful Christian right-wing should have made the politically-astute wonder. I know they made me start to think about his politics (we should remember that libertarianism, like socialism, comes in a variety of flavours some of which are attractive to those of a leftist leaning wary of big-state socialism). At that address in Sydney he also said that he was uncertain about anthropogenic climate change. I was sitting in the audience and this struck me as strange on two counts: one, that the farming system Joel had adopted offered a part-solution to carbon capture in farmland soils; two, many, I would guess most in the audience were interested in his farming system partly as a climate change amelioration strategy. “We spent time with him as part of the Churchill adventure in 2008. Having implemented and adapted Salatin-style integrated biological farming methods over 9 years, we were excited to meet and share ideas. “It was not a fulfilling meeting. His blind faith in his prescribed cookie-cutter farming methods, in Christ and in the superiority of men, was gobsmacking. “Later, at Terra Madre in Italy, I spoke to a woman who had worked at Polyface and was still traumatised. Reading this, something clicked in my brain: haven’t we been here before? Haven’t we had heroes advocating some kind of agricultural system who have had seemingly contradictory personal characteristics? We have. The agricultural system is called biodynamics and the person in question is Rudolf Steiner. Biodynamics was based on Steiner’s ideas. The point of referring to Steiner is to show that what we might see today as self-contradiction among agricultural heroes is not new. We all live with our contradictions, however they are more glaring and troublesome in public figures who influence people. The tone of the comments following Nick Rose’s posting of the link to the article have displayed disappointment and criticism. They have also drawn a line between Salatin’s farming system, which commentators see as valuable in carbon sequestration and in agricultural practices of value to regenerative farming, and his politico-religious and social ideology. ” …he’s a loudly self-proclaiming proud libertarian fundamentalist Christian. He’s working the system and makes a small fortune, aka his “white collar income”, off the back of unpaid intern workers”. A comment stating “Lunatic puts it well” elicited this response from Michael: “But he means well”. Joel is of course entitled to follow his own politico-religious beliefs and, as commentators have stated, they should not prevent us from adopting some of his agricultural practices and acknowledging his role in regenerative agriculture. His addressing the Red Pill Expo might have had value in introducing some in the audience to regenerative farming, however with his apparent political similarity the value of this must be questioned. 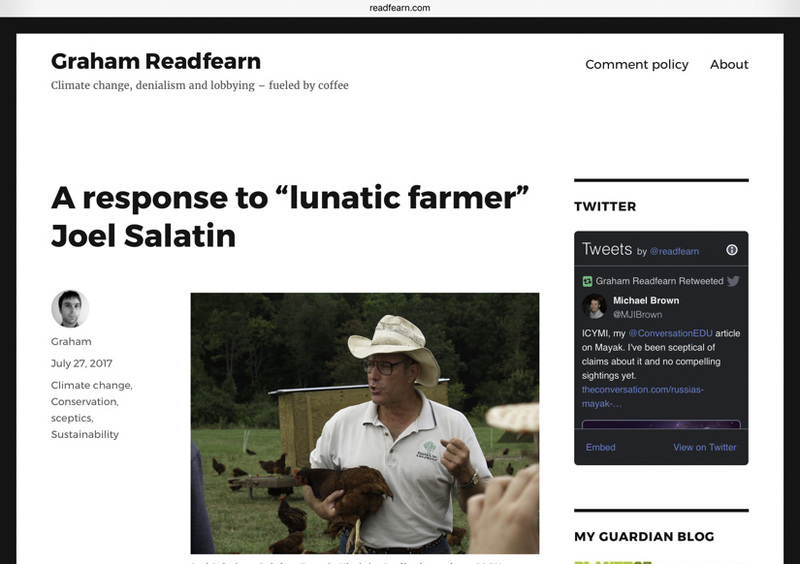 What we have here among regenerative agriculture practitioners and supporters in Australia, though, is cognitive dissonance over Salatin’s social/political/religious attitudes and his farming system. People recognise the value of his farming system but his attitudes are out of synch with those of many in that movement in Australia. There is a second disconnect, too. It is Salatin’s adopting an approach to farming that would form part of any larger strategy to ameliorate the worse impacts of a changing climate while being a climate change denier. It is understandable that some see this as a glaring contradiction. We should be clear that the adoption of environmentally beneficial farming systems does not necessarily imply what the Americans would describe as a ‘liberal’ politics among adopters. There is no reason why farmers of right-wing leaning would not care for soil as much as those of left-wing proclivity. It’s just that if we trace the popularisation of the organic farming and food movement to its modern origins in Australia we find it coming from a social coterie with socially-liberal values markedly different to those of the fundamentalist Christian Right. What surprises me, given Salatin’s self-description at public events in this country, is that it took people so long to recognise the possibility that his personal ideology is contradictory to that of so many in the regenerative agriculture and permaculture movements. With Trump in power and the deregulation and slashing of US environmental regulation, it is reasonable that people might see Salatin as his ideological fellow-traveler. This reinforces Mike Hume’s wise warning about hero worship. Choose your heroes wisely and consider their politics, religious attitudes, social and environmental ethics. My guess? I don’t think we’ll be seeing Joel Salatin in Australia again anytime soon. After I wrote this story the controversy over Joel Salatin’s politics continued. Joel wrote a response to Graham Readfern’s story. Then Graham wrote his own response to Joel’s response. In his response Graham refers to a number of Australians who had commented in the Facebook dialogue or had written about the issue. He made reference to Nick Rose, director of Sustain: The Australian Food Network and lecturer in food systems at William Angliss Institute of TAFE in Melbourne. A lengthy conversation had appeared on Nick’s link to Graham Readleaf’s original article on Facebook. Commenting on Robert Pekin‘s piece on Facebook, Graham chose to disagree. In his response, Graham talks about how he had a phone conversation with the Australian Food Sovereignty Alliance’s president, farmer Tammy Jonas, who had made some pointed comment in her criticism of Graham’s original article. He also quoted from my article above. This is all healthy dialog and it shows that prominent people’s statements and their associations can dent their reputation even when they are not about what they are best known for. The conversation makes it clear that, as commenters said, the issue in not about Joel Salatin’s farming system, that all hold to be exemplary. It is about his role as an influential farmer and food advocate in appearing to support the politics of climate-denialism. This is seen as a contradiction — a farming system that has potential to reduce the carbon emissions of agriculture developed by a farmer who has doubts about the role of humans in causing the warming. We all live with our own contradictions, however the difference comes when we achieve a position of social prominence and influence.